Hungary's far-right Jobbik party has staged a rally in central Budapest in protest at the capital's hosting of the World Jewish Congress (WJC) on Sunday. 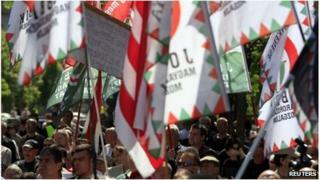 Jobbik said the rally was a protest against what it said was a Jewish attempt to buy up Hungary. The party, which says it aims to protect Hungarian values and interests, is the third largest in parliament. It regularly issues anti-Semitic statements. The event in Budapest on Saturday was billed as a tribute to what organisers called the victims of Bolshevism and Zionism. "The Israeli conquerors, these investors, should look for another country in the world for themselves because Hungary is not for sale," party chairman Gabor Vona told the rally, according to Reuters news agency. Marton Gyongyosi said Hungary had "become subjugated to Zionism, it has become a target of colonisation while we, the indigenous people, can play only the role of extras". Last year, Mr Gyongyosi had sparked outrage by saying all government officials of Jewish origin should be officially listed, as they might be a "national security risk". Image caption Party chairman Gabor Vona told the rally Hungary was "not for sale"
Some of those taking part in the rally were wearing the black uniform of Jobbik's banned paramilitary wing, the Hungary Guard, which has been accused of vigilante action against Roma (Gypsy) communities. Prime Minister Viktor Orban had ordered police to ban the march, but a Budapest court overruled the ban, saying it had been based on "unfounded presumptions". Mr Orban instead instructed the interior ministry to use all lawful means to prevent the event, which goes against the constitution". Security was tight around the rally, with police blocking several streets, but there were no reports of unrest. The WJC usually hosts its assembly in Jerusalem, but has chosen Hungary this year to highlight what it says is growing anti-Semitism in Europe. The focus of its summit this year will be on the "alarming rise of neo-Nazi political parties and anti-Semitic incidents in several European countries, including Hungary", it says on its website. Spokesman Michael Thaidigsmann said the Jobbik rally was a "worrying sign that these people express their anti-Semitic and anti-Israeli ideology in such a public way".